Canalino Elementary teacher Brandon Sportel was surprised with the statewide Milkin Educator Award at a special school assembly. 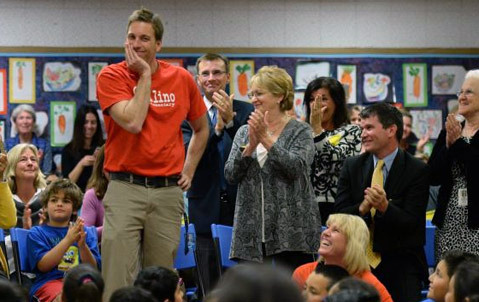 Last month, Carpinteria special education teacher Brandon Sportel was shocked when State Superintendent of Public Instruction Tom Torlakson and state officials showed up to present him the Milken Educator Award and a $25,000 prize. “[It was] one of the biggest surprises I’ve ever had in my whole life,” Sportel said. A Michigan native, Sportel teaches 11 students with mild to moderate disabilities at Canalino Elementary School. The Milken Educator Award Foundation commended Sportel for his optimism and strong work ethic inside and outside of his classroom. “He is the ultimate team player willing to lend a hand on behalf of any student or family,” according to a post on the Foundation’s website. Sportel is considered an area expert in special education, and his advice is often sought by teachers and staff at other schools. He also works with student teachers and hosts emerging psychologists and behaviorists. As a side project, Sportel and his team created a program for teachers to build interpersonal relationships with their students. The idea is for teachers to find out more about what is going on in their students’ lives. Sportel credits the Carpinteria Unified School District for his success. “The teachers I work with are amazing. They are my teachers. I have learned so much from the new teachers we have up to the older ones,” he said.